Now Accepting Students Worldwide or Locally in Portland, Oregon. 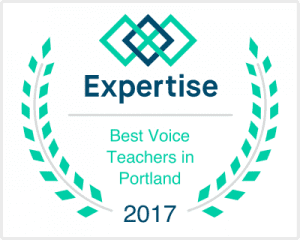 With many options for voice lessons in Portland, Confident Voice Studio is consistently voted #1 by our customers. Our teachers, location, involvement in the community, business philosophy and our focus on serving our customers are just a few of the things that we believe contribute to earning that place in our customers’ minds. Everyone has value and should be accepted, included, encouraged and affirmed through their interactions at Confident Voice Studio. We must be honest and kind to each other at all times. Our studio is stocked with everything students need to create a great learning environment. From inspiring posters, to music stands, mirrors, whiteboards and a keyboard, we make sure to have a comfortable and safe space for lessons to take place. We maintain an open door policy with parents who want to sit in on a lesson from time to time. At Confident Voice Studio, students will learn to train their ear, expand their range and find their own unique tone. We offer training on how to properly use your voice to get the best sound and avoid injury. Every voice is different, so lessons are tailored to individual needs in order to develop the voice to its full potential. We understand that voice lessons can be scary, so we work to learn about who you are, what you want and how to best help you learn. You will spend your lesson time on a mixture of warmups, exercises and learning songs you enjoy to help build your repertoire. Many of our voice students use this time to prepare for upcoming auditions, performances, or simply to continue to develop their talent. Once scheduling is out of the way, it’s time to rock. You will meet with your teacher once a week at the same time each week for 30, 45, or 60 minutes, depending on which you select. Our favorite lesson length for most students is 45 minutes because it allows time for building a relationship, warming up, reviewing what was learned in the previous lesson and providing new instruction. 30 minutes is great for younger students and an hour-long lesson is great for more advanced students who are interested in accelerating their progress. We offer several music lesson options. These various packages offer options to our customers to match their needs related to schedule flexibility, pricing and commitment. 5) You suspect you have (or have been diagnosed with) a vocal injury or disorder from which you need vocal guidance for your recovery. 5) You are aware of psychological or spiritual issues around your singing that you wish to work through, including perfectionism, extreme fear, loss of artistic purpose, performance anxiety, loss of vocal self-esteem, reticence to sing or having quit singing even though you long to do so, and depression accompanying any of these states.